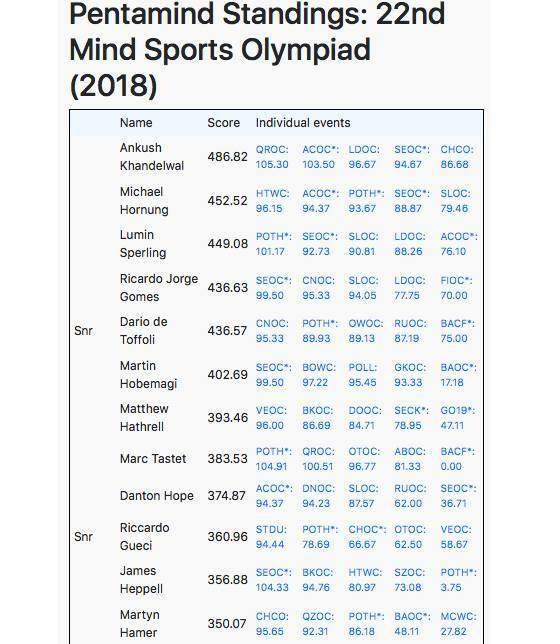 The XXII edition of the Mind Sports Olympiad took place from the 19th to the 27th of August 2018 at JW3 of Finchley Road, London. The number of organized tournament is growing across the years, and it is everytime more difficult to choose the ones to compete in. As you can see, there’s room for everybody, even board-gamers, and I hope this time more will come. I will be attending the event, of course, with Riccardo Gueci, Daniele Ferri, Cosimo Cardellicchio, Piero Zama… but it should be time for new recruits to show up. This is the personal schedule I think to follow: on the first column tounaments I think to attend, on the others, tournaments I must give up. I will eventually modify something during the competitions, based on tactical needs that may arise. The 4 medalist of the last year have all confirmed their partecipation… and they are all fierce contenders! But this year ther’s also the more than welcome competition comeback of Piero Zama, one of the few people who started playing before than me! 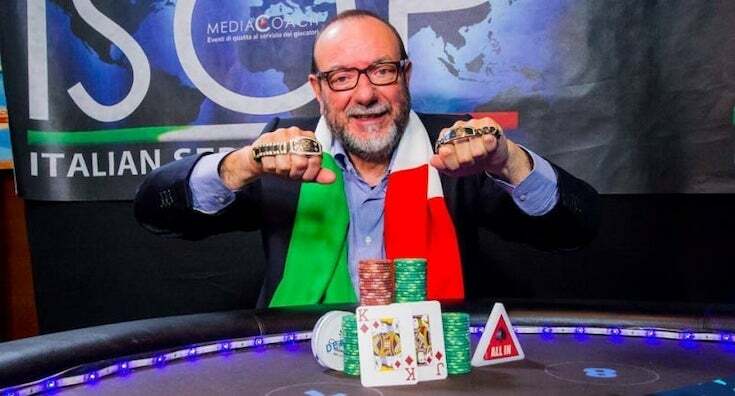 In the 80s he has been Italian Champion of both Mastermind and Risiko! and he already joined a MSO (in 2004) gaining 4 medals, 2 golds among them! I remember clearly and with pleasure the italian Mastermind podium, gold to him, silver to me! For sure with his presence we will gain some additional medals… but we will be competitive mostly in senior ranking, considering that 5 of us sums about 300 years! So, young champions, show youselves! Chronicles from the boards 1. 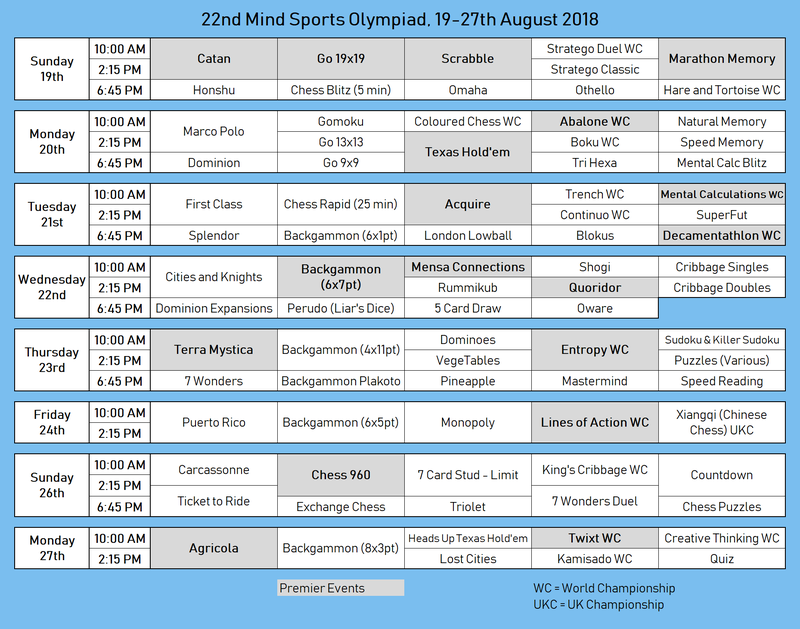 Tomorrow, on the 19th of August the XXII Mind Sports Olympiad starts in London. 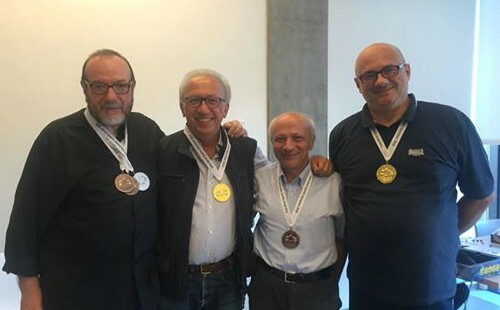 The oldie’s team (me, Riccardo Gueci and Piero Zama, all of us born in 1953) is ready to engage the battle during all the 8 days of competitions… the main goal is to repeat the all-italian podium in the Pentamind “Senior” and bring home some nice medals. In the overall rating it will be hard to place someone of us into the first 10 positions, because there are many really strong players, young and well trained: Kuusk, Kahndelwahl, Heppel, Gomes, Hamer, Hebbes, Pearce, Jameson, Dixon, Hathrell… only to mention some of them. 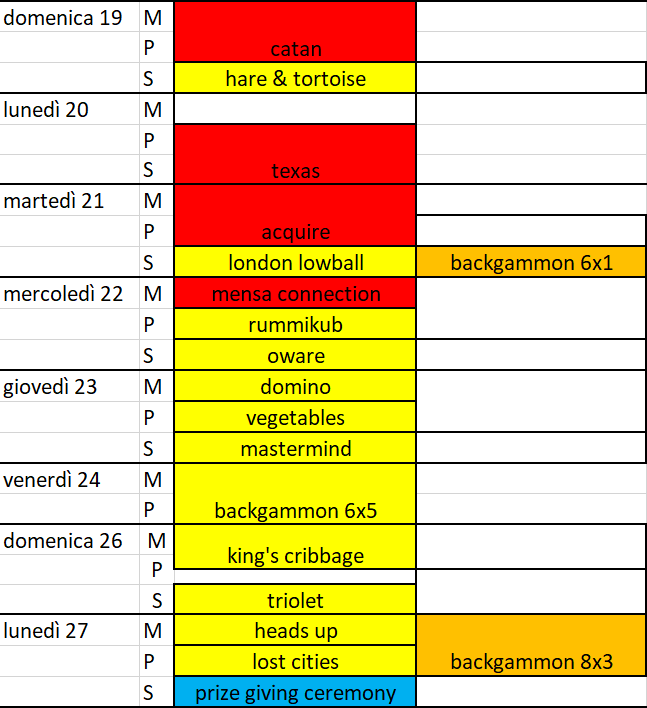 Tomorrow me and Piero will compete in the Catan tournament, while Riccardo will try Stratego and Stratego Duel; in the evening Piero and Riccardo will play Othello, while I will attend Hare&Tortoise (the mythic “carotine” of David Parlett). 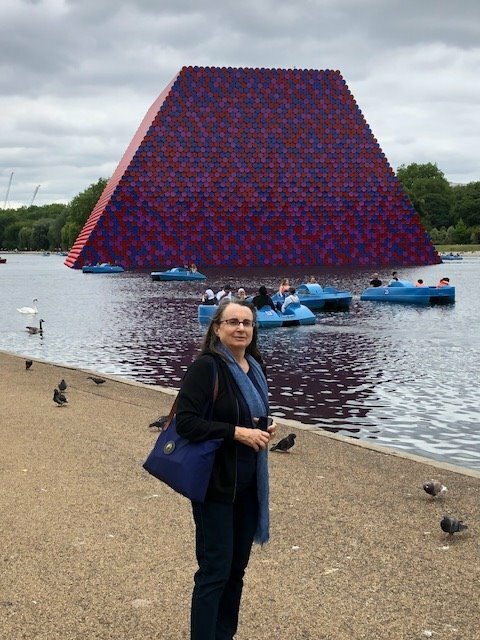 In the meanwhile today just some sightseeing at the Serpentine to look for The London Mastaba. Chronicles from the boards 2. 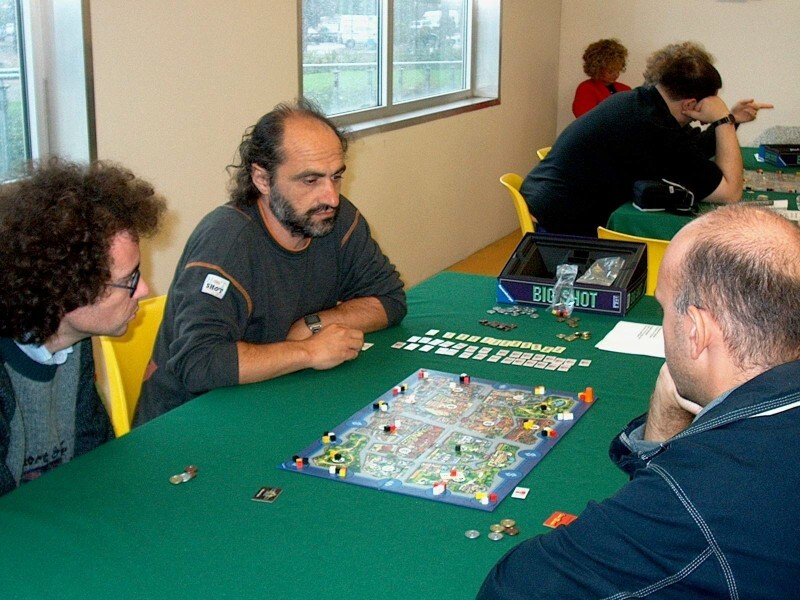 We start with the blast by Riccardo Gueci who manage to win for the third consecutive year the gold medal and title o World Champion at Stratego Duel, a variant of the classical Stratego that is played with 10 pieces but only 2 minutes per player, 3 seconds Bronstein every move. So much for who call it a game of luck. In Othello a really good silver for Luigi Puzzo who, with 4 victories out of 5, loses only to the french specialist Marc Tastet, who made a comeback to the MSO after 14 years. 4 out of 5 also for Piero Zama, who took the “wood medal” (4th place) at the tie-break. By now, I must be content with my 5° placement in the Texas Hold’em tournament, at last played in two different sessions instead of only one: no medal for me, but 90 precious points of long tournament for the Pentamind. Unbelievably, the Hold’em tournament has been won by Tastet himself, who is everything but a specialist… we can say the wind was always at his back; with these two gold medals, he is a real contender for the highest places of the Pentamind. Could it be the french year? 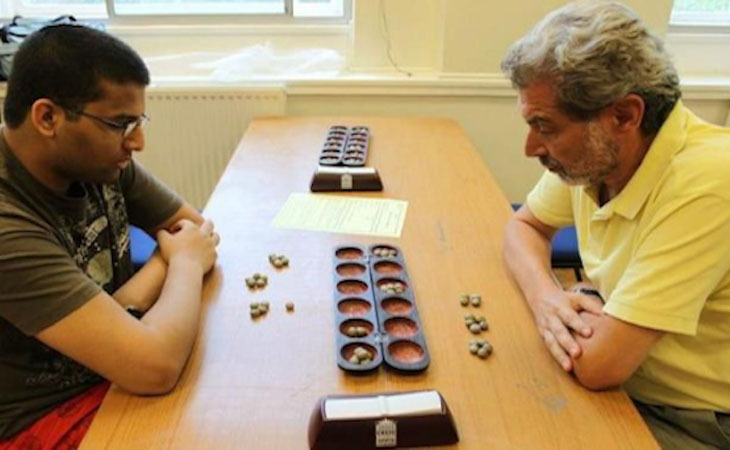 Vincent Frochot won Abalone (the game has french origin) and Florian Jamain, Twixt’s specialist, started really well with a silver in Gomoku and a gold in Tri-hexa. Yes, we should keep an eye on the french, they are really good! But at the top of the Pentamind we already find an estonian: I’m not talking about Andres Kuusk, but about the 18 years old Martin Hobemagi, who already won multiple Pentamind Junior. He took the gold in Boku and Gomoku. An overwhelming team, the estonian one! Today we get to the heart of the competition with the Acquire tournament, which will be played by me, Piero Zama and Daniele Ferri; instead, chess for Riccardo. Chronicles from the boards 3. “The second gold for Italy is by Piero Zama! When it seemed the third day would finish as bad as it could be, at last the big performance by Piero Zama in Backgammon (6x1pt) who takes the second gold medal of our flag. Congratulations. What about everything else? Nothing notable, as I said. A disappointing Acquire for our 3 partecipants (Dario De Toffoli, Piero Zama and Daniele Ferri), while in the chess tournament I must stop right behind the first positions, after wasting a big chance of making a good placement, with 3 victories, one draw and two unfortunate defeat, the last one really ridiculous. Fine. In the evening I got into/bored with Blokus with Piero Mazzilli, joining at last, but without any result, while as I wrote Backgammon gave us the last cherry. In the Pentamind, surprisingly, I consolidate the seventh place with 313,96 points (ah if only chess would have gone better…), while the estonian Martin Hobemagi is still in first place with 381,40 points. In the Pentamind Senior Piero Zama is approaching me with 287,80 points, while in third place follows Dario De Toffoli with 247,34 points. Consider that our capitain has not still entered fully the competition (after 3 days being without medals I think is a record for him, thinking that in 21 previous editions he took ‘only’ 100 of them), but trust me that he will start winning more shortly, and he will overcome everybody in the Senior for sure . 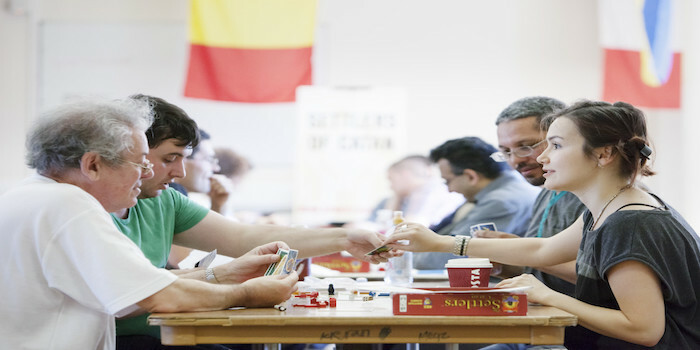 Tomorrow morning we wait for Mensa Connection, then for me and maybe Piero Mazzilli, Quoridor, while Daniele and Dario Rummicub (where they are the favorites), and lastly in the evening there will be poker (5 card draw), Perudo and Oware. I add only that in the Acquire tournament – one of my favourite game between all – I ended up in between, but I have nothing to be angry for, some of the matches played, especially those with Tim Hobbes and Danton Hope (ended up bad for me) have been among the best that I have ever played… it’s a shame nobody has recorded them! Chronicles from the boards 4. In the last two days I got three second places and one third place, and I unexpectedly made it into the high rank of the Pentamind (5° with 436,57 points, onli 6 hundredth away from the 4° and also leading the “Senior” ranking… sure, Heppel, Kuusk and other various young “monsters” will be able to reach me and overcome my score, but by now they are all behind . The incredible thing is that all of this happened to me even without winning any medal. How is it even possible, you ask? That’s possible, even though unlikely, thanks to the bizarre tie-break rules used by MSO: instead of playing a couple more rounds (thing that coulb be possible by slightly improving the organization) here they stop the competition after 5 rounds and solve the ties by summing the score of the defeated opponents (it is a chess derived system that I don’t think is the best choice in other tournaments. However that’s it, these are the rules and they must be followed. Mensa Connection (our Geniale). I win 4 out of 5, losing by a little margin only to the youn corean Jihyun Lee that will then win the tournament. We are 4 in the same situation (with me Daniele Ferri, Tim Hobbes e Ricardo Gomes) and the bronze medal goes to the portuguese, to me only the wood medal. 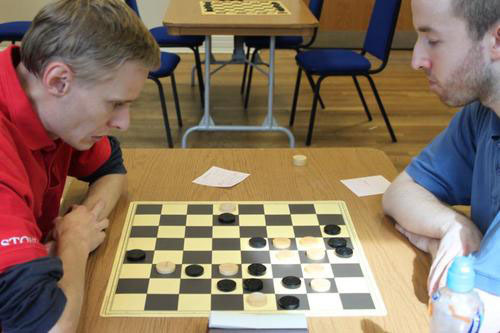 It was obvious that with about fifty players at least another round was needed, round that the two players with 5/5 played accordingly… but why just them? Boh. At Rummikub another jackpot for Daniele Ferri, who is really the best; I won again 4 matches out of 5 (I lost only one to another corean, Jungyun Bong) and… another wood medal! An Oware evening followed, and again I win 4 matches out of 5, losing only to Glenda Trew, organizer of the Oware International Society: another wood medal because of the first easy round where I played against a kid (corean, again!) who was not that good and who lost all the matches, lowering my tie-break score. Yesterday Backgammon to 11 points; I won all the matches but one, again, losing only to the old iranian fox Mahmoud Jahanbani, who managed to do miracles… even if die were mine . 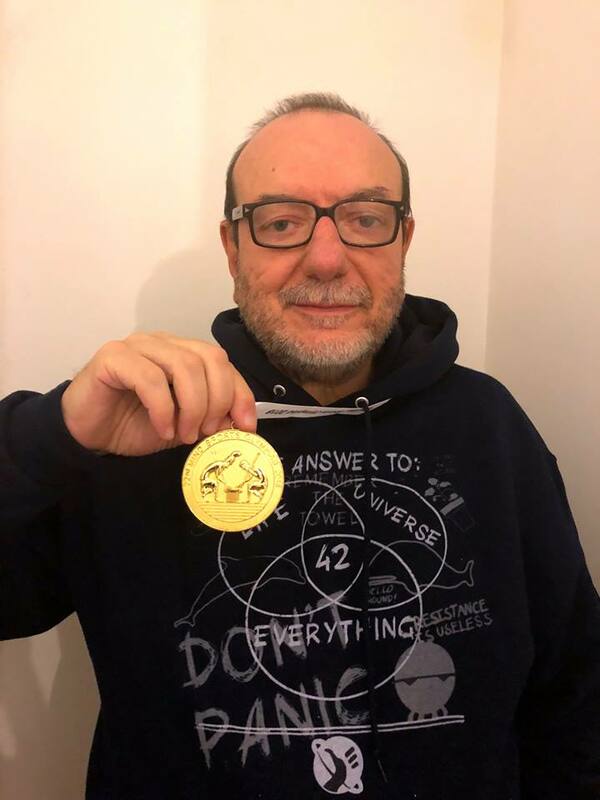 Other news, Daniele Ferri competed in “his” VegeTables tournament, winning the silver only, with gold that goes to the unbeatable Matthew Hathrell as usual. Days without glory for Piero Zama and Riccardo Gueci, even if they follow me closely in the Pentamind Senior. Today I will play another backgammon tournament… I don’t really want to play Monopoly! Chronicles from the boards 5. Ooh oooh! Yesterday I gained the gold medal, Backgammon, in a swiss tournament, 6 rounds to 5 points… 6 victories strike!!! The most incredible thing is that with this victory my score in the Pentamind ranking went up to 457,22 points and I’m in 4th place, behind a monster trio: Ankush Khandelwal, that with his 496,91 points is almost the virtual champion, and then Andres Kuusk 474,14 and James Heppel 461,36. 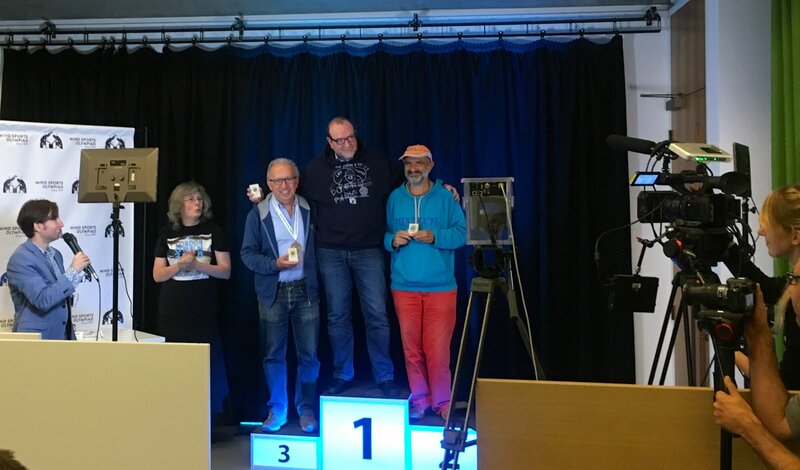 And then I am in first place in the Pentamind Senior (over 60) where by now there is a full italian podium with Piero Zama (bronze medal in Monopoly!) and Riccardo Gueci behind me. Today rest day and on sunday and monday the last two days of competitions… with a really interesting schedule. To be honest, I didn’t expect to score that many points, I would have been content with slight more than 400 . Better like this… it means I can still do good stuff! Chronicles from the boards 6. Ok, it’s over. It has been hard… and I miss it already, must wait another year, but many projects are coming alive, long term ones, we will see. 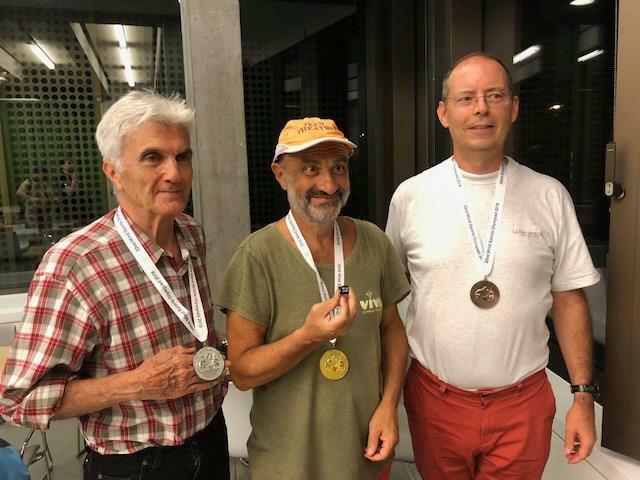 Meanwhile in the last day of competitions, huge gold medal by Piero Zama in Lost Cities, bronze to Riccardo Gueci in Kamisado and more important the podium of the Pentamind Senior is italian-only once again. This rank has been established in 2016 and in these first three editions I always managed to get the gold… I mean, oldie but still lively. In the overall ranking took a deserved first place Ankush Kahndelwahl, english, but born in India: he did crazy things, like – he that do not play chess professionally – win a tounament of chess 960 (Fischer-random, where the starting position of the pieces is randomly determined) despite the presence of a Grandmaster with 2700 Elo: it is really in the Fischer-random, where talent beats studying! On the podium also the tremendous estonian couple, Martin Hobemagi and Andres Kuusk. Fourth place to James Heppel, winner of 2017 edition. With my 457,22 points I got the 9th rank, reaching my goal of coming within the first ten. Here you can follow the awards and the tournament of Lost Cities, there’s also one of my match (ended 1-1) with the french Florian Jamain.